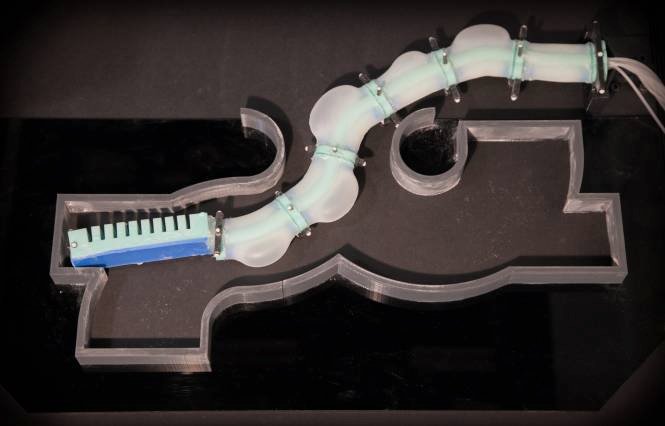 Soft Robotic Tentacle Slithers Through Pipe Like a Snake #3DxRobotics #3DThursday #3DPrinting « Adafruit Industries – Makers, hackers, artists, designers and engineers! …The arm, which was fabricated using 3-D-printed molds, is the latest in a series of projects in CSAIL Director Daniela Rus’ research group that focus on the burgeoning field of soft robots, which have the potential to be safer, more resilient, and more efficient for certain tasks than their rigid-bodied counterparts. The mobility of traditional “hard” robots is limited by their fixed joints: They can’t move in confined spaces, and have to be programmed very precisely to avoid collisions that might harm them or their environments. In contrast, the deformable structures of soft robots means they can squeeze into tight spots and change direction more nimbly. They are also resilient enough to handle minor collisions — and potentially even use these encounters to gain information about their surroundings. In the case of CSAIL’s robot arm, the research team — which is led by doctoral candidate Andrew Marchese and also includes Rus and PhD student Robert Katzschmann — developed complex algorithms to determine the body curvature needed for the robot to make a diversity of different motions. For all of soft robotics’ potential, the field’s relative newness means that researchers are still exploring the best approaches to topics like motion planning and actuation. For example, the robotic arm is so soft that a typical motor shaft cannot be attached. Instead, the CSAIL team fashioned hollow, expandable channels on both sides of the arm that, when pressurized with air, put strain on the elastic silicone and cause it to change shape like a balloon, allowing the arm to bend to one side. Another unique feature is that the arm is made completely of silicone rubber — a constraint that challenged the team to develop the necessary programming for a robot that, with its 100 percent soft body, is better suited to navigating human environments….